Hiya guys! 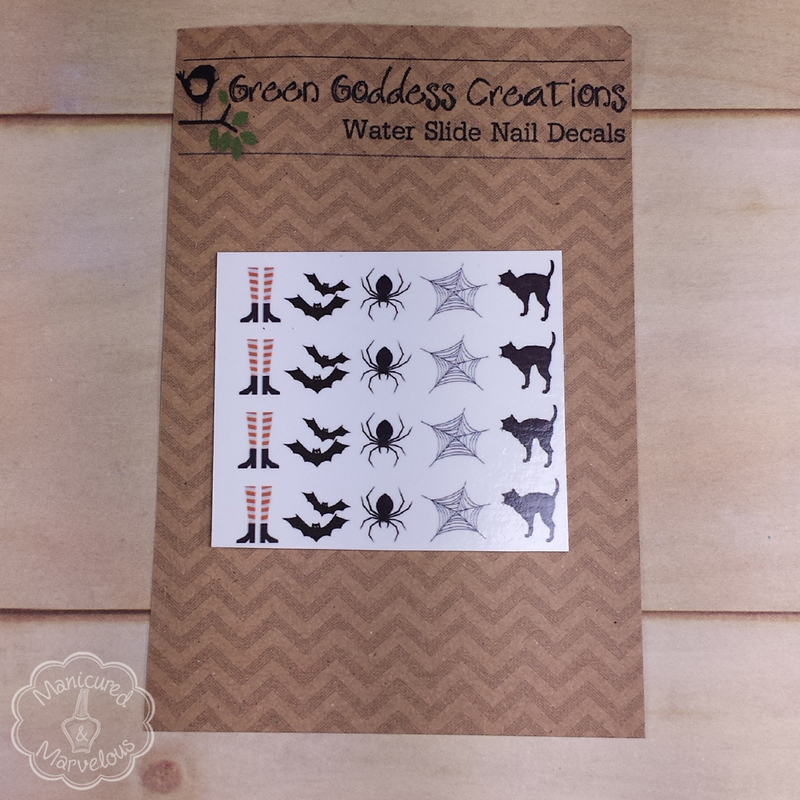 Today I am sharing a review for some beautifully spooky water nail decals from Green Goddess Creations. Although this is the first time I am reviewing this indie brand, I have been a fan for a very long time now. 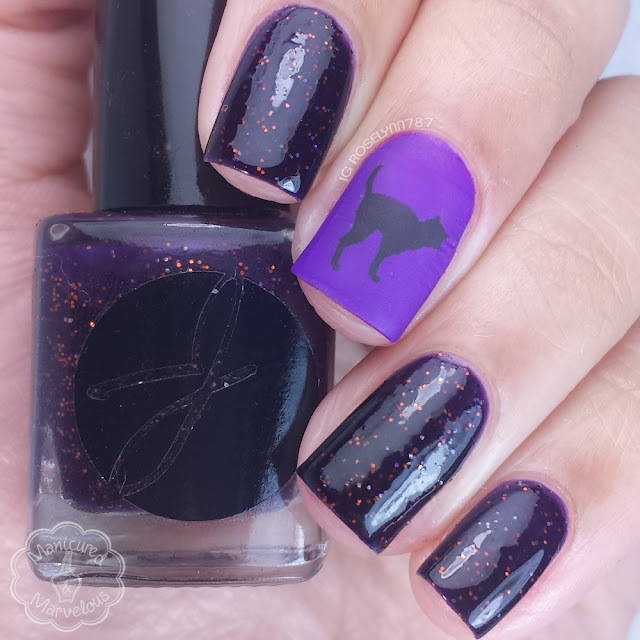 The decal sheet I am reviewing today is called Get Spooked and it is perfect for Halloween (of course)! I briefly spoke about these decals a few weeks ago in the review for the collaboration collection Ladies of the Fright with Jior Couture. 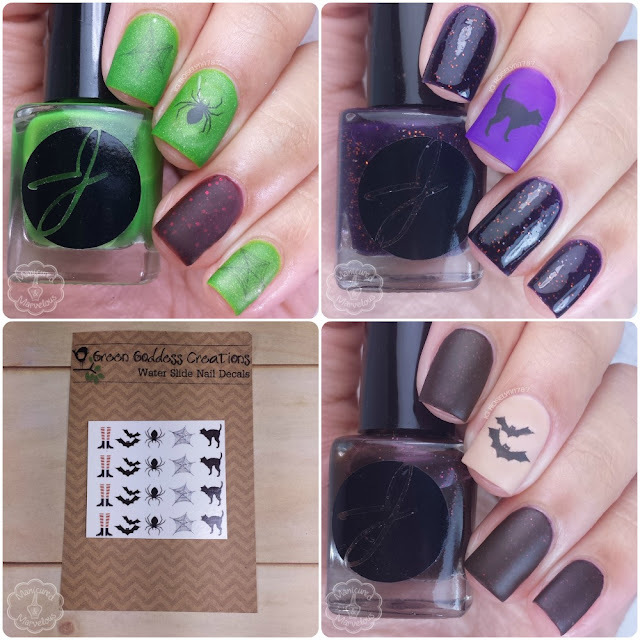 The Get Spooked Nail Decals by Green Goddess Creations are available for purchase for $5.00 per sheet. Each sheet comes with 48 images. This decal sheet also comes with your purchase of the Ladies of the Fright collection by Jior Couture. Photographed above is the sample sheet, but as I mentioned before the full sheet will come with 48 images. I've been using Green Goddess Creations decals for a long time, ever since my nail bestie turned me on to them. The quality is really fantastic and in my experience these are some of the easiest water decals I have used. Just soak in water for about ten seconds and then just slide them onto your nail. It's the perfect solution when you need a cute mani, but don't have more than a few minutes to spend on your nails. 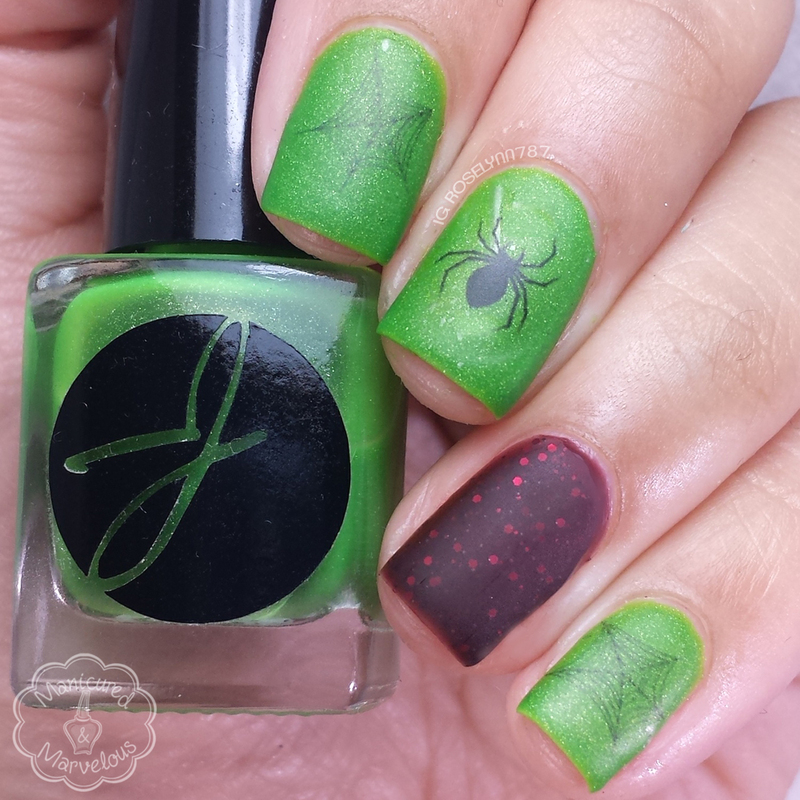 Since the Ladies of the Fright collection was a collaboration between Green Goddess Creations and Jior Couture I decided to use polishes from that collection for these decals. Let's get to the manis! As a rule of thumb water decals always tend to look better in lighter bases because they are slightly transparent. Personally I also find it best to apply them over a smooth base, like a creme finish polish. For this bat design I decided to apply it over a neutral creme. With this decal I feel I didn't cut close enough to the design, hence the slight wrinkling around the edges. That right there is probably my number one tip for anyone using any kind of decals. Cut as close as possible to the design! These were probably my favorite decals and polish choice meshed together. 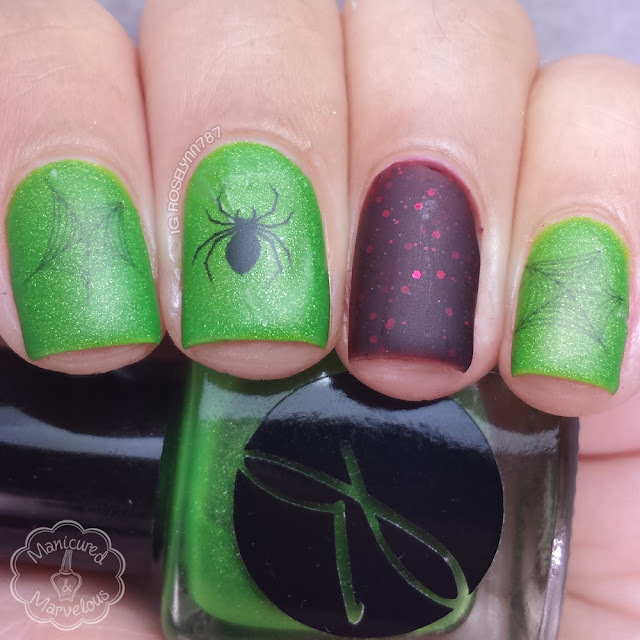 Although I do have to note that I should have cut the spider a bit closer to the design, but I still love the way it turned out. Overall I am more than satisfied with the application process of these decals from Green Goddess Creations as I always have been. I have quite the Green Goddess Creations collection so far and that's simply because of the impressive quality and store selection. Everything from Doctor Who, to Pretty Little Liars, to Batman just to name a few of my favorites. Definitely recommend checking out the store. I am in love with all the manis you created using them! I love the matte look. Although I do prefer stamping since I can reuse the same plate over and over, I can see how easier decals are for beginners! I'm not a fan of water slide decals, but I like the polishes from the collection. They are lovely! Especially matted. I have heard such great things about her decals. I really need to try them. Cute looks, decals can be so much fun! Love the manis you did with the decals! And Rusalka is gorgeous! These are so cute.. Love the cat one especially. I love the mani! I am so envious of the mix-and-match look- I swear I can never quite make it "work" as well as this. All of these are so fun!! The decals and polishes look great! These are so pretty! 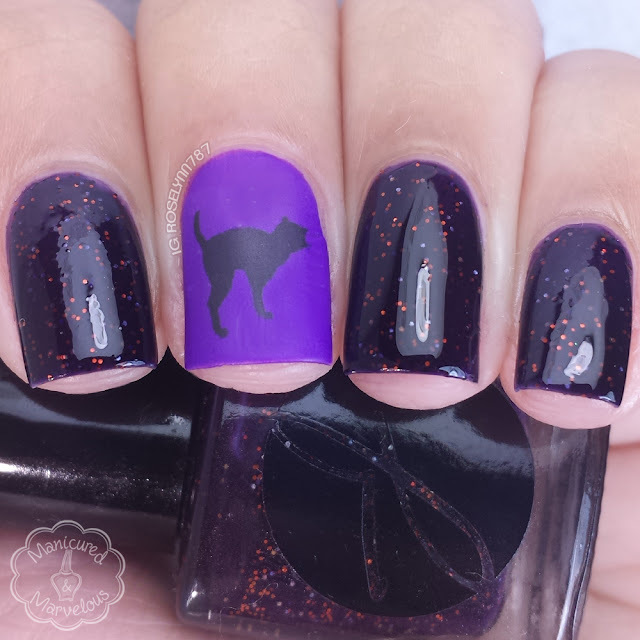 Love the black cat mani! Love these! The spider one would scare me but I just love, love, love the cat one! Super cute!! I love green goddess!! these are so perfect for the season!!! Love them, and way easier than freehand art!! 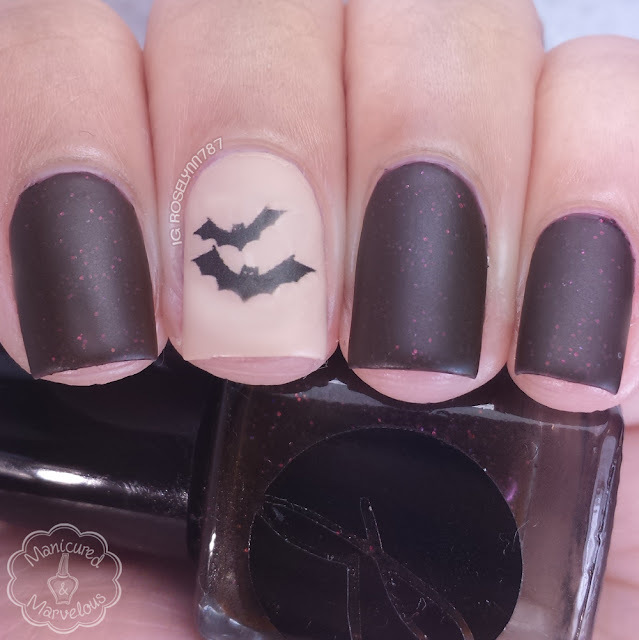 The decals are cute and perfect for Halloween! I actually have a really bad fear of spiders lol.